There is loads of choice when it comes to festive theatre in Cornwall this year but here is something you won’t find anywhere else. The team behind summer’s ‘a pinch of SALT’ season of dance performances on beaches and gardens around Cornwall, are presenting a brand-new Christmas show (until 28 Dec). 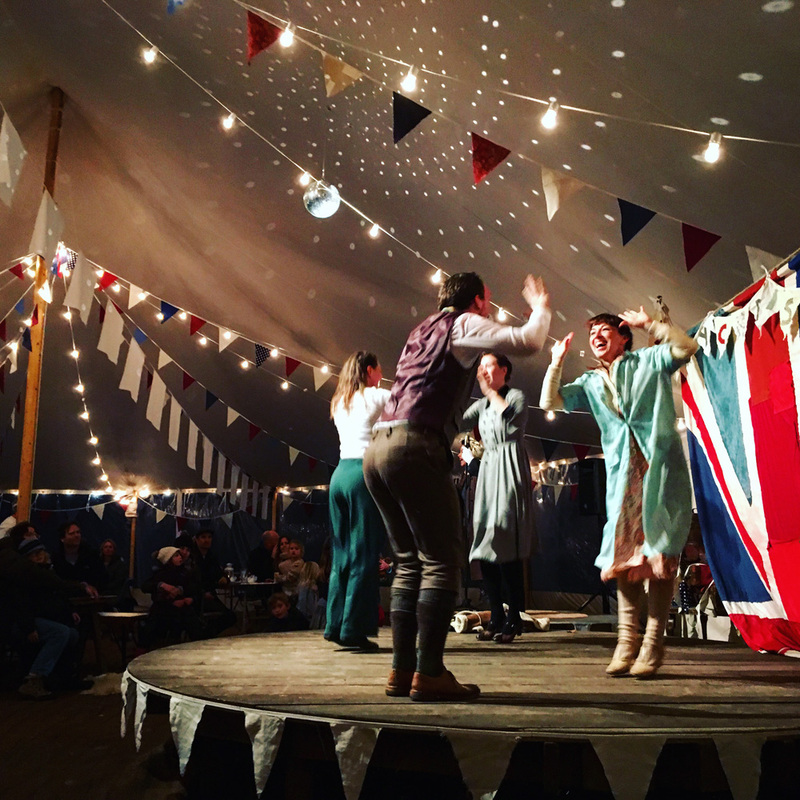 Held in the beautiful grounds and gardens of Padstow’s Elizabethan Manor Prideaux Place, the show transports the audience back to Christmas in wartime Cornwall (1941 to be exact), complete with land girls, evacuees and the sound of fighter planes whirring threateningly overhead. 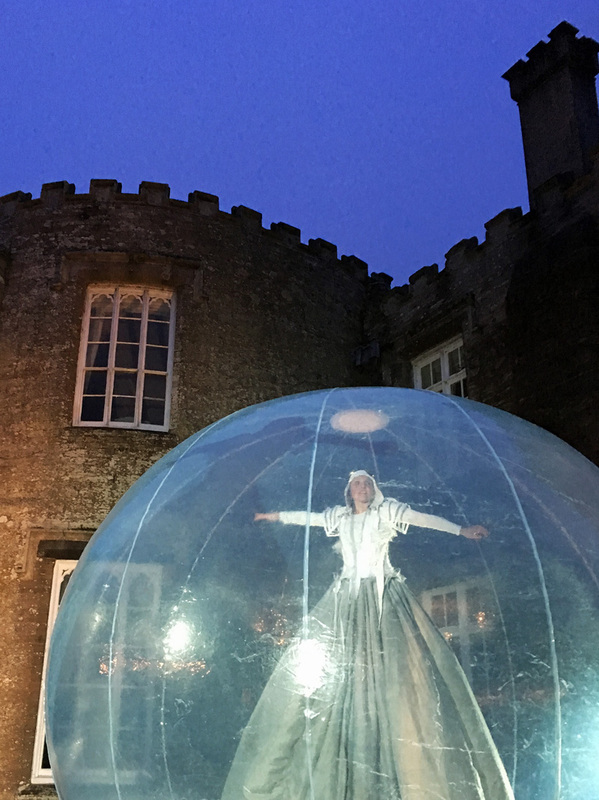 Prideaux Angels is a promenade performance, which wanders the grand and bewitching grounds of Prideaux Place, beginning in a marquee on the front lawn and taking in the gardens, kitchens and various other nooks and crannies of the estate. Although it was a bit foggy and mizzly the day we went, some of the scenes were undercover and it all genuinely added to the atmosphere. Plus it enhanced the feeling of warmth and welcome in the marquee at the end, where warm stew, courtesy of Ed Stein, was waiting (pre-orderable with tickets). The family-friendly story draws you in from the beginning, as the children are invited to make paper angels and snowflakes for the Christmas tree that Lady Bridget was simply too sad to decorate this year. As we wandered from scene to scene, the children in the audience were ushered to the front, where they could see the action and cast members chatted to us in character as we went. Speakers seemed to be cleverly hidden everywhere, so wherever you happened to be standing the dialogue and music was clear, filling even the outside spaces. The prettiest scene for me was in the back gardens, where paper lantern birds flew out of the manicured hedges. 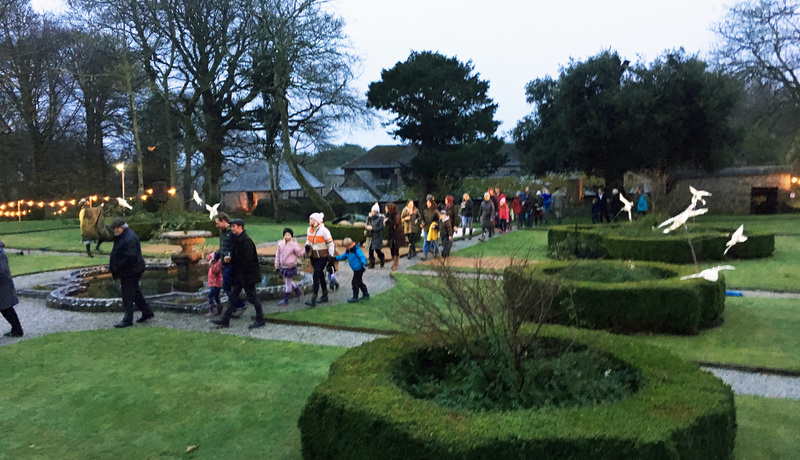 Here, a robin returns on the wind to Prideaux Place for Christmas, with a mysterious visitor in tow, who brings a sprinkling of magic back to the manor. 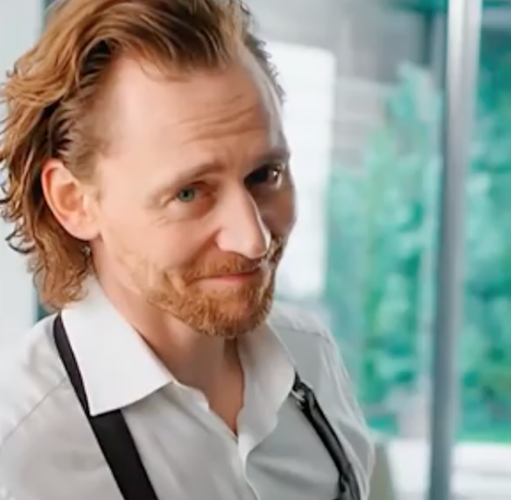 I also loved the kitchen scene, where the chef and Lord Edmund dance while preparing the party food – similar scenes will be played out in the Muddy kitchen this Christmas! 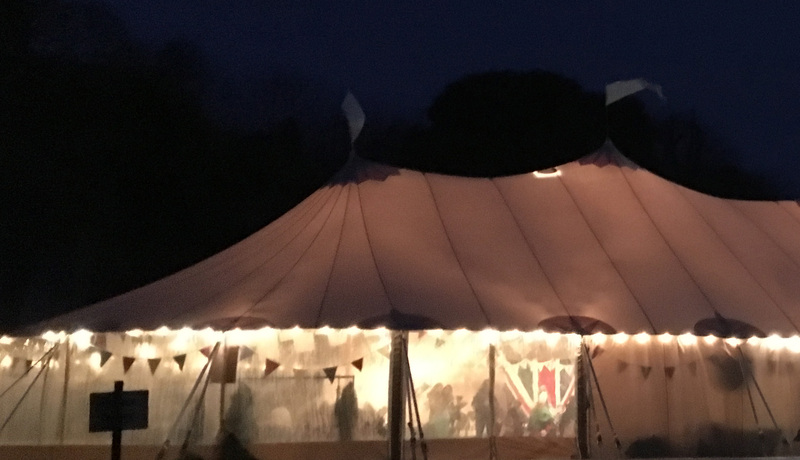 It all ends with some festive boogie woogie back in the marquee, where the audience has a really sense of being part of a good old-fashioned Christmas party. I think braver audiences will jump up and join in the dancing at the end – I settled for a bit of baby bouncing but the music and energy was infectious. The team behind the show is led by Choreographer Simon Birch who’s beautiful show Shoreline was seen across Cornwall in the summer. He is joined by designer Myriddin Drualus Pharo, (Wildworks), Composers and performers Claire Ingleheart and Jon Hughes, plus dancers Emily Dobson, Anthony Middleton, Debbi Purtill and Isobel Slingerland. Tickets: Adults, £12 / Children, £8. Family ticket £35 (2 adults/ 2 children). Matinee and evening performances are available. I went with my husband on Christmas Eve and we really enjoyed it. 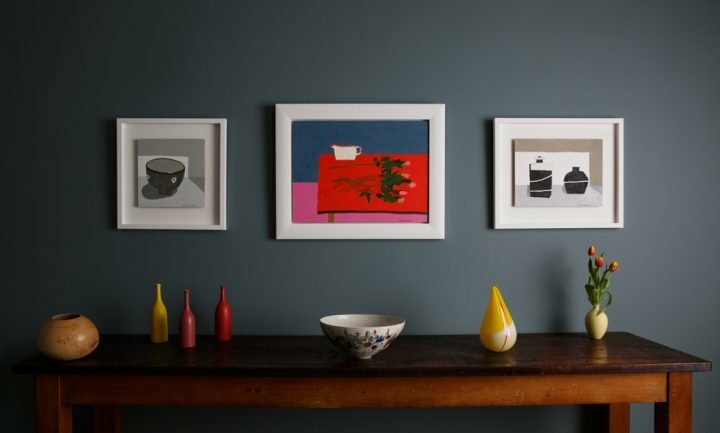 It was very different and a perfect start to our Christmas in Cornwall. Thank you to the wonderful cast.